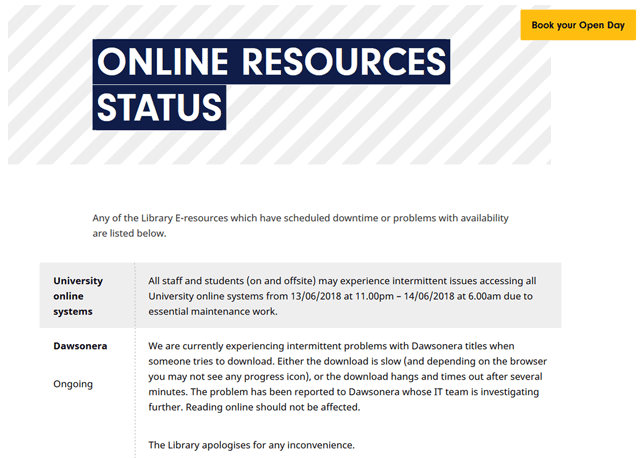 The Library at the University of Derby recently collaborated with EBSCO Information Services to co-create unique search interfaces and introduce a series of innovations aimed at improving the user experience. These innovations included a range of clearer icons linking through to full-text journal articles and abstract-only resources subscribed to by the Library, apps linking to additional online resource content and a fresh interface design and style. Billed as Library Plus 2.0, the project aimed to significantly improve the accessibility and visibility of the Library’s online resources, while providing an enhanced user experience shaped through consultation and engagement. This article looks at the impact of the Library Plus 2.0 changes and identifies improvements for future implementation. The work contributes towards the Library’s digital strategies and the continual enhancement of our core systems. The author presented this work at the University of Derby’s 13th Annual Learning & Teaching Conference in July 2018. The Library at the University of Derby provides access to print and online resources, information technology and learning spaces (including 24/7 provision) for around 21,400 students across five site libraries. It sits within the newly created Centre for Student Life which includes the Library, Careers & Employability and Student Experience, with a shared philosophy of delivering transformational learning and scholarship and meeting the needs of our students, researchers and academics through co-creation, inclusivity and collaboration. It supports and underpins our institutional Strategic Framework that shapes the direction of the University, focuses on a student-centred approach to service and embraces a digital culture for the 21st century. In 2015 a second EDS platform – branded as Discover – was introduced exclusively for students at Buxton & Leek College, a further education (FE)/higher education (HE) College that is now part of the University of Derby. The implementation of Discover took a different approach to Library Plus, allowing opportunities to work directly with EBSCO in creating unique customizations and features within the EDS framework that would work for a specific audience (in this case, 16–18 year-old FE students) and be tailored accordingly to the learning and teaching process. The Discover project allowed us to think ‘outside the box’ and understand more about the mechanisms and workings of our systems. 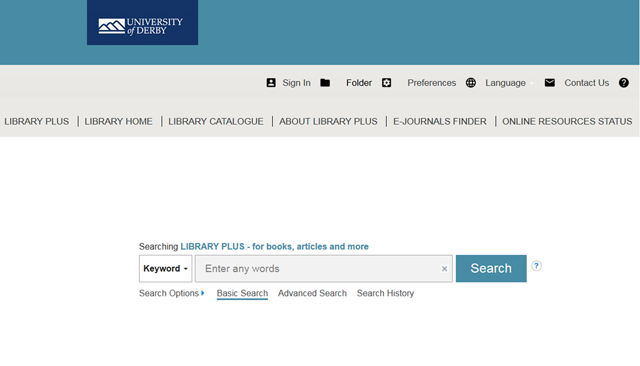 The Library worked again with EBSCO in 2016 to co-ordinate the replacement of the legacy Electronic Journals A-Z platform with Full Text Finder. 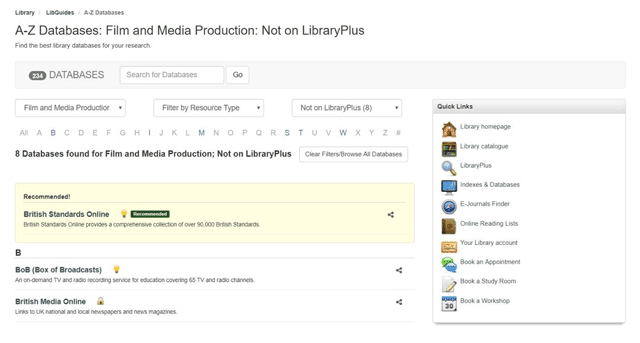 This new holdings platform – branded as E-Journals Finder – allowed us the option of integrating directly with Library Plus (as opposed to a traditional stand-alone model). While these projects made considerable improvements to the user experience, we wanted to go further and took the decision to re-evaluate our original discovery platform. Library Plus is an essential component in our learning and teaching strategy and is well used by our students. However, the platform had largely remained the same since its original launch and, inspired by the work we had done with Discover, we wanted to enhance the user experience significantly. The aims of the project, referred to as ‘2.0’, were to improve accessibility and visibility of the Library’s resources and make them fully discoverable within Library Plus. We also wanted to create an enhanced experience for users, exploring what was possible in terms of customization and visual design. To achieve these aims, we worked in partnership with EBSCO to create and implement a series of customizations specifically for Library Plus. Upon completion, the 2.0 project would be launched across the institution through a series of initiatives including social media communication and promotional events. Finally, we wanted to be able to measure the initial impact of the project (through usage metrics), reflect upon the work and identify improvements that we could make to take our discovery platforms forward into the future. 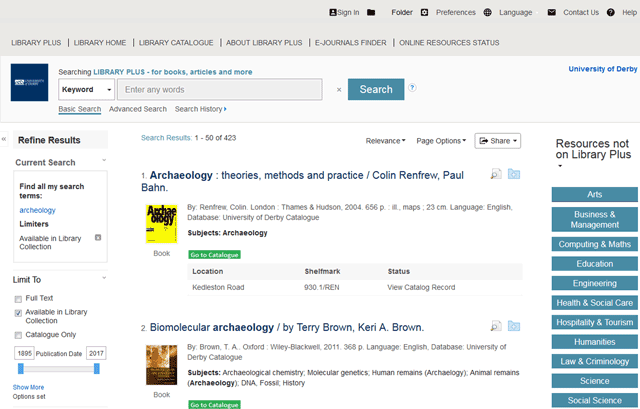 Initial changes to the search interface of Library Plus were made prior to the 2.0 project from August 2016. These were primarily based around feedback submitted to the Library Enquiry Services Team (typically by e-mail or phone), the E-Resources Team (via e-mail) and the Academic Services Team from information literacy sessions or in person at our Subject Information Point. There were two key issues raised by our students that stood out. Firstly, students (especially undergraduates) were often frustrated that their search results brought back records with no full-text access. To manage these expectations better, the Library introduced a two-tiered search approach: in the basic search, users would only retrieve results that provided access to full-text journal articles, full-text e-books and links to book records via our Library Catalogue; in the advanced search, users would retrieve all of this plus additional results where no full-text was available (with records containing only an abstract or basic citation details and no link to full-text content). The two-tier search achieved a balance between two different sets of users: our undergraduates who often require a simpler search functionality (influenced by Google’s universal search) and immediate access to content using the basic search mode and our postgraduates, researchers and academic staff who require a greater depth of literature and ‘discovery’ via the advanced search mode. Secondly, students also found the icons that link directly to subscribed content confusing. 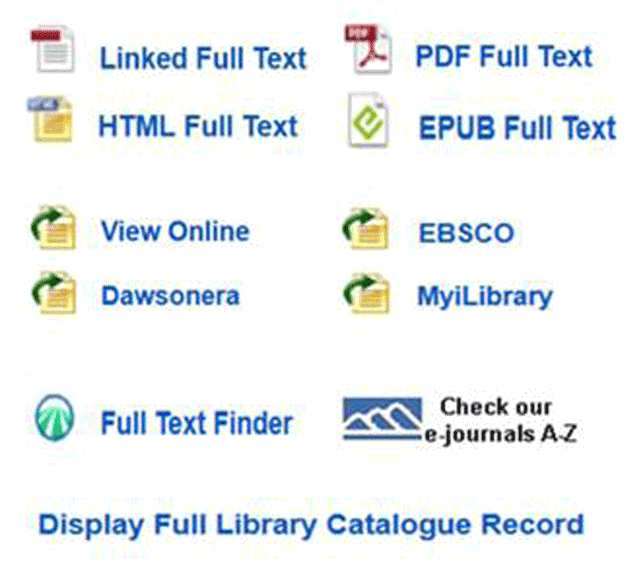 The original Library Plus icons (many of which were standard within EDS) included three separate descriptions of full text (‘PDF Full Text’, ‘Linked Full Text’ and ‘HTML Full Text’), several variants for e-book suppliers, and a lengthy catalogue icon (‘Display Full Library Catalogue Record’), shown in Figure 1. 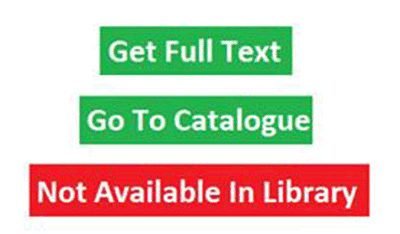 These were replaced by two customized green block-style icons – ‘Get Full Text’ and ‘Go To Catalogue’ – which link directly to full-text articles and catalogue records respectively. A third icon, ‘Not Available In Library’ appears in abstract-only results in the advanced search, indicating that the specific content is not accessible via the Library (Figure 2). It was especially important to capture student feedback in the initial planning of the two-tiered search and customized icons. During the summer of 2016, Library staff consulted with students based at the University’s Kedleston Road, Markeaton Street and Britannia Mill sites to ask for their opinions on whether they preferred a two-tier search approach or whether the search functionality could remain the same. We also presented students with a selection of potential new icon designs and asked them to choose their favourites. We ran the same exercise with Library staff from different areas of the service (Academic Services, Enquiries Service, Facilitators, Loans Service, Acquisitions, and E-Resources). The pre-2.0 project improvements influenced the direction in which we would take Library Plus in the future. The innovations for the 2.0 project were intended to build on the success of the two-tier search model and customized icons. The design and implementation process began in the autumn of 2017 through to completion in March 2018. A collaborative partnership with our supplier was crucial to the success of this project and the E-Resources Team were in regular contact with the Technical Team from EBSCO during this process. Prior to the 2.0 project, EBSCO met with members from the E-Resources and Academic Services Teams to demo examples of best practice at other institutions (both academic and corporate) and this was helpful for us to identify ideas which could be implemented within our own discovery set-up. Following the meeting, EBSCO created a test profile based on our suggestions and utilizing best practice in HTML 2.0 web design. The most significant change was the visual look and feel of the interface. Previously, the search boxes were very small and there was a lot of empty space filling the screen (Figure 3). Now the interface has a much more dynamic look with a bigger search box and a brighter colour scheme (Figure 4). A new addition is the ‘search indicator’ – a blue line that identifies when a user is in basic or advanced mode and switches between the two (Figure 5). The banner (with links to different pages) remains in place at the top but the graphics are bolder and clearer than before. The new-style template continues into the search results page (Figure 6). The second major innovation, on the right-hand side of the results, is a series of customizable apps or widgets grouped under the heading ‘Resources not on Library Plus’ (Figure 7). These icons are grouped by subject area and link to filtered pages from the Indexes & Databases list (part of the Library’s LibGuides), either directly or by a drop-down menu (where the subject area is broader in scope) as shown in Figure 8. Some providers will not enable their metadata to be sourced within Library Plus because of competitor and publishing restrictions. This causes frustrations for some users and can adversely affect the discovery experience. This is a common issue for academic libraries; for example, Koury and Brammer noted similar challenges with EDS at their institution,2 and on a global level, Zhu and Kelly have reported on the challenges faced by vendors and librarians alike to resolve the gaps in content across different discovery services.3 With the creation of these icons, we were able to manage user expectations more effectively, allowing them to have access to these important databases while using Library Plus as their starting point for search and discovery of resources. 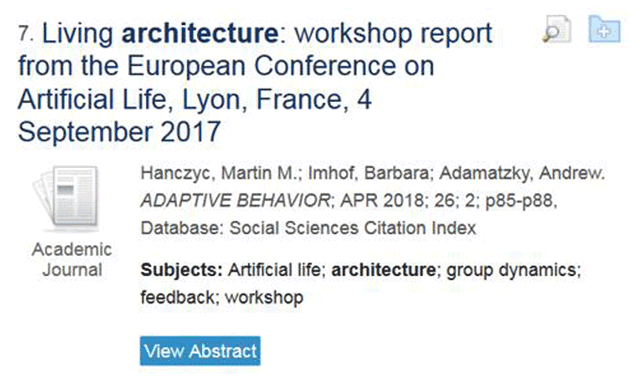 A third development was the introduction of a new icon linking directly to databases that only provide abstracts or non-full-text content (such as technical standards, conference proceedings, etc.). The new icon, ‘View Abstract’ is currently being rolled out on a limited basis and is only available through the advanced search mode (Figure 9). As part of a continuous programme of improvement for its customers, EBSCO has rolled out some additional features. Auto Complete (also known as ‘Popular Terms’) and Auto Correct provide Google-style functionality while typing in search terms. 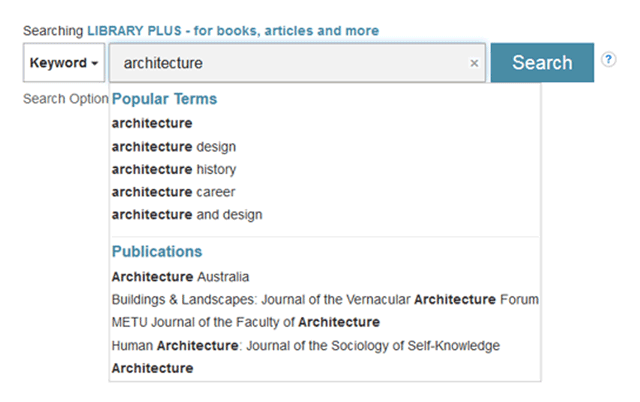 A separate ‘Publications’ list is an example of the integration with E-Journals Finder, bringing back a list of relevant titles for the user while searching (Figure 10). The impact of the 2.0 project necessitated a more consistent approach in how we branded and promoted Library Plus across our site libraries and the wider institution. Our central focus was a newly designed logo or ‘tile’, which had already been deployed as part of a series within the University’s student portal ‘UDO’ (a separate project co-ordinated by IT Services) and would already be familiar to students using the UDO mobile app. By using an established design recognized across the whole institution rather than creating separate ‘library-only branding’, we ensured a consistent approach and avoided different visual identities that could have caused confusion for users (Figure 11). A promotional campaign was also important for raising awareness of the improvements and disseminating them to colleagues, academic staff and students. Advance notice of the changes (and any subsequent developments, including launch events) was achieved through e-mails to Colleges and departments, Library representation at College meetings by the Academic Services Team, the University’s internal communications channels and the Library homepage. 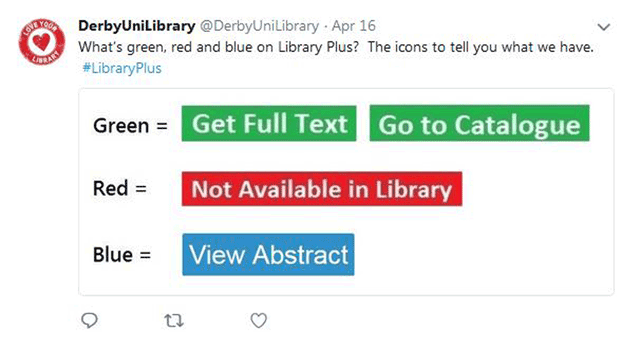 We also used the @DerbyLibraryUni Twitter account as a method of engagement,4 with timed tweets informing students of the new features and linking into themes based around the colours of the Library Plus icons (red, green and blue), shown in Figure 12. Engagement and outreach to staff and students was also an important component of the promotional campaign. The 2.0 project was officially launched in the third semester after Easter with a series of promotions across our sites. The improvements were demonstrated ‘live’ in the University Atrium, complete with a selection of Library Plus-themed sweets, badges and distinctive clothing to match the icons (Figure 13). The event was well received, with 41 visitors in total engaging with us during the day. Similar promotions were done at Britannia Mill Library and at the Markeaton Street campus (as part of a weekly Pop-Up Library initiative). Awareness and training sessions for Library staff were also held at our Kedleston Road and Buxton campuses. The Library continued to monitor usage for Library Plus in the months prior to and immediately after implementation. Typically, we report on four separate metrics: sessions (number of times a user logs into Library Plus), search clicks (number of searches), full text clicks (number of full-text articles accessed) and abstract views (number of abstracts viewed). A snapshot of usage data for Library Plus was captured for the period beginning March–August 2018. This was not intended to provide a full assessment (as it only covers the pre- and post-implementation periods), but it would show some initial indicators of impact resulting from the 2.0 project improvements. Tables 1–4 show data for each individual metric across March–August 2018, comparing usage against the same six-month period in 2017. The relevant increase/decrease in activity was recorded as a percentage. There was a significant increase in usage during the period in each of our standard metrics. For sessions reported in May 2018, we observed an increase of 69% on the previous year (Table 1). For search clicks, there was a 59% increase in May and a 39% increase in July, again on previous years (Table 2). For total full text views, we reported increases of 87% in May, 23% in June and 45% in July (Table 3). Finally, the total number of abstract views reported significant increases of 33% in March, 45% in May and 204% in July (Table 4). When analysing the results, May and June were the months that showed the greatest increases. August is traditionally a quiet time of year and while session views and search clicks showed modest increases, full-text clicks and abstract views were reduced. These initial findings are encouraging and illustrate an increase in user engagement with Library Plus across all reported metrics. 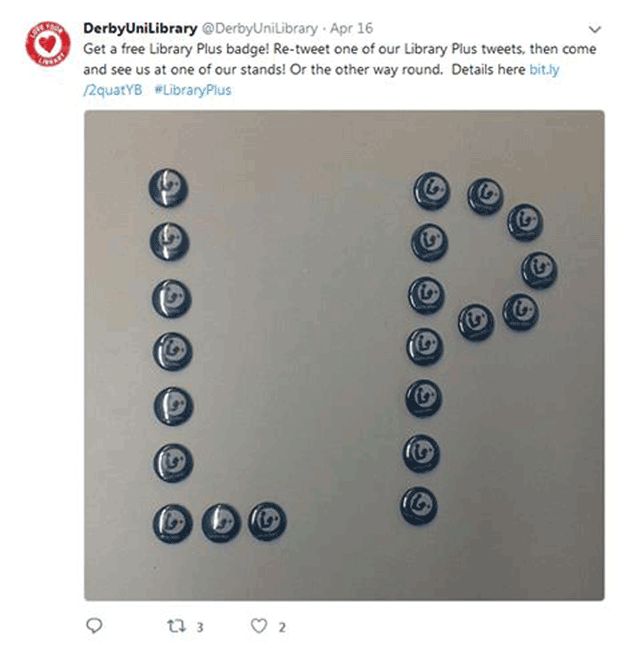 The Library’s promotional activities may partially explain the increase, reinforcing the need for active and regular campaigns across the year (rather than one-off events). However, we would require at least 12 months’ data in order to measure the effectiveness of the 2.0 project changes. With the new features in place for almost six months, it was time to take a step back, reflect upon what we had learnt from the project, what had worked for us and what we could have done differently. Having a comprehensive project plan (incorporating design, testing, implementation and promotion stages) was crucial to the success of the project. In particular, the scale of the 2.0 project required a different approach to promotion using social media and internal communications in a way that had not been done before. While the Library has increased the profile of its official Twitter account with heavy promotion of the 2.0 project and other user services (most recently Online Reading Lists), there is less engagement in terms of numbers compared to other Twitter feeds associated with the University and the Union of Students (Derby’s official student body). It is evident that engagement with social media is beneficial in the long term: examples of best practice are evident across other institutions5 and we need to follow their lead. There are opportunities to learn from internal and external partners in using social media to reach their target audiences and disseminate key messages, for example, by retweeting and sharing key information across Twitter feeds. We could also look at using other platforms for user engagement such as Instagram. Capturing feedback on systems performance will also be important and we will consider online polls to ask users about the improvements they would like to see (preferably, once a new idea has been officially launched). Staff attendance at our promotional events was lower when compared to student engagement, although this can be partially explained by the regular communication facilitated by Subject Librarians at college and departmental level, for example, updating academics with new developments at College Quality Committees and Programme Committees to keep them in the loop. Some staff may also do their own independent research or teach information and research skills themselves, therefore not always necessitating a face-to-face visit within the Library space. The importance of different Library teams working collaboratively to deliver service improvements and facilitate effective cross-team working cannot be underestimated. Although the E-Resources Team were able to provide technical knowledge, contacts and led on the implementation, the Academic Services Team worked more closely with academics, and delivered over 1,200 sessions last year (including inductions, in-class sessions, workshops, appointments and drop-ins). Training on Library Plus was an integral part of many of these sessions. The Enquiries Team also brought a different perspective when dealing directly with students and resolving queries. Sharing knowledge across the teams helped develop an understanding of differing needs and will ultimately enable us to establish a better service. Linking and integration with shared systems within the Library remains a key priority. 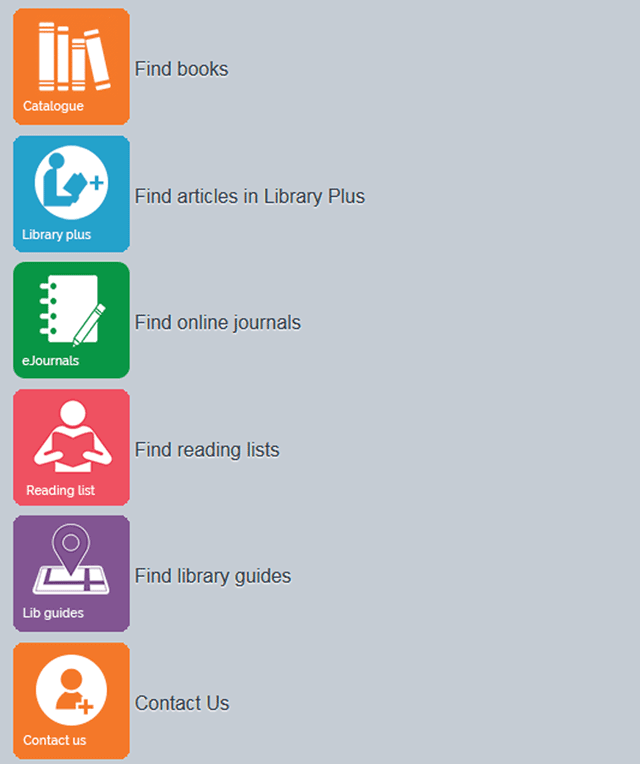 Currently we link to Library catalogue records (from Capita Prism) via the ‘Go To Catalogue’ icon and there may be scope to create or develop further icons in order to enhance the user experience. The ‘Not Available In Library’ icon could be expanded to show options for obtaining items outside the Library’s collections, for example, inter-library loans sourced from the British Library. We could also investigate integrating our online reading lists software into the discovery interface via a separate ‘Reading Lists’ icon. Although not captured directly within the sessions, accessibility of e-resources from the perspective of students with disabilities is becoming a key issue for us (and across the HE sector). We will need to work closely with EBSCO and other suppliers to offer appropriate advice for using alternative formats and read-aloud software within Library Plus. Systems compatibility feeds into this discussion and how the Library adapts its existing systems to link with third-party applications, browsers, operating systems and mobile devices. The 2.0 project is a significant step forward in the way that we use discovery systems at the University of Derby. With a mixture of new and innovative features and a co-ordinated promotion strategy, it is recognized as a key part of the Library’s digital infrastructure. Going forward, our challenges will be to enhance our systems and engage with users to ensure continuous improvement and best practice. All of this will sit within the context of the University’s Strategic Framework as we seek to deliver student-facing services and establish a digital culture. It is anticipated that discovery tools will continue to play a vital part in this process, delivering real impact for our users and empowering them to succeed in their studies. The author would like to thank Gareth Smith at EBSCO and Robert Bley at Ex Libris for granting the necessary permissions for figures included in this article. Figure based on total number of sessions during the 2017/2018 academic year (August 2017 to July 2018). Data taken from internal ‘Library Plus and Discover Usage’ report, updated monthly. Koury R and Brammer C, Managing Content in EBSCO Discovery Service: Action Guide for Surviving and Thriving, The Serials Librarian, 2017, 72(1–4), 83–86; DOI: https://doi.org/10.1080/0361526X.2017.1309828 (accessed 5 December 2018). Zhu J and Kelley J, Collaborating to Reduce Content Gaps in Discovery: What Publishers, Discovery Service Providers, and Libraries Can Do to Close the Gaps, Science & Technology Libraries, 2015, 34(4), 315–328; DOI: https://doi.org/10.1080/0194262X.2015.1102677 (accessed 5 December 2018). DerbyUniLibrary: https://twitter.com/DerbyUniLibrary/status/985834305107742720 (accessed 5 December 2018). Chatten Z, Making social media work: finding a library voice, Insights, 2017, 30(3), 51–61; DOI: https://doi.org/10.1629/uksg.374 (accessed 5 December 2018). Woods J et al., Discovering discovery: lessons learnt from a usability study at the University of Liverpool, Insights, 2016, 29(3), 258–265; DOI: https://doi.org/10.1629/uksg.320 (accessed 5 December 2018). Shapiro S D, Discovery tools as electronic billboards to market your library, Library Hi Tech News, 2014, 31(10), 10–12; DOI: https://doi.org/10.1108/LHTN-07-2014-0062 (accessed 26 November 2018).